BOLD Act proposed by ARTBA generating interest in Washington. Comprehensive user-based funding model built on industry consensus. Considering the political turmoil and competing interests in Washington, a trillion-dollar federal infrastructure initiative isn’t liable to be passed any time soon. As a result, the BOLD Act proposed by ARTBA is gaining attention on Capitol Hill as a potential permanent revenue expansion fix for the Highway Trust Fund (HTF). 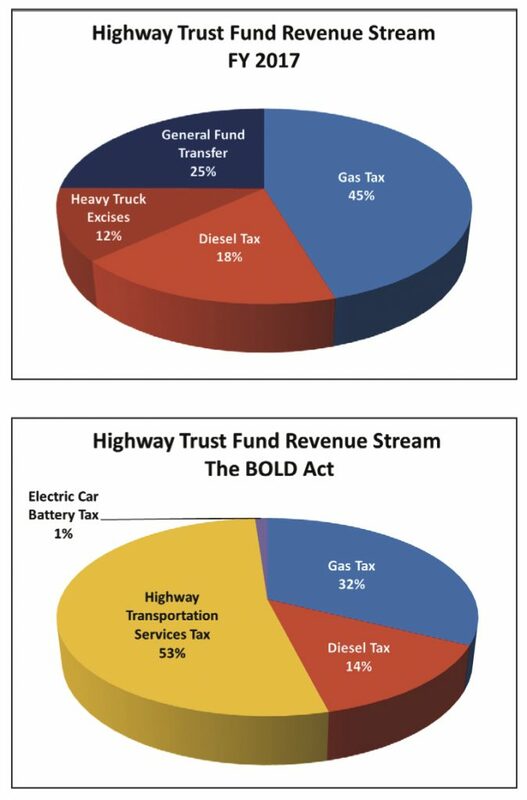 These before-and-after pie charts demonstrate how the nature of revenue sources for the federal Highway Trust Fund (HTF) would change, if the BOLD Act proposed by ARTBA is enacted. The BOLD Act initiative was begun by ARTBA in October 2016 by uniting individuals from a cross-section of the its membership to form a special task force. Funding was provided via major contributions from diverse stakeholder companies and trade groups. This enabled ARTBA to assemble an outstanding technical and lobbying support team. As a backdrop, the Partnership for America’s Economic Expressway is already helping to position highway investment as the priority focus for any infrastructure initiative that may emerge. ARTBA is working to piggy-back those efforts to encourage inclusion of the BOLD Act in any major tax bill that might move through Congress this year. Components of the plan. The crux of the comprehensive BOLD Act proposal, which was forged through widespread industry discussion and consensus, is a sound user-based funding structure for the HTF. 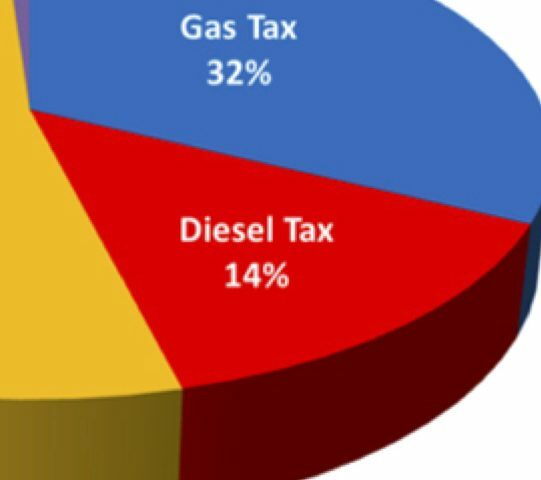 For starters, the BOLD Act proposes to maintain current per-gallon tax rates for gas and diesel fuels — while eliminating current heavy-truck sale taxes, truck usage taxes and tire excise taxes. A new 6.25% federal Highway Transportation Services Tax would be applied to the cost of goods shipped domestically via Class 7 and Class 8 heavy trucks. This is modeled on the way air cargo is currently taxed. A new federal Electric Motor Battery Highway Use Parity Sales Tax of $1,200 would also be applied to the sale of rechargeable lithium-ion batteries. This one-time FET on the first retail sale of a battery. which would be a cost of manufacturing, is designed to establish parity with gas-tax revenues. These monies will be earmarked to provide a dedicated, sustainable revenue stream for mass transit investment. Fast-track investments in the National Highway Freight Network (NHFN) authorized by Congress in the 2015 FAST Act. Capitalize a National Infrastructure Bank. Leverage private funds and support bonds/tax credits to finance high-cost transportation projects in all modes. The push for support. To date, ARTBA has had over 100 meetings concerning the BOLD Act with members of House and Senate bipartisan leadership, along with the Senate Finance and House Ways & Means committees. Multiple meetings were also held with key White House staff from the National Economic Council, Domestic Policy and Treasury Department staff working on tax reform. President Trump has also been personally briefed. ARTBA is asking all members and transportation infrastructure advocates to make their respective US Senate and House legislators aware of the BOLD Act — a well strategized proposal to put the Highway Trust Fund back on solid footing through consistent and substantial funding.